This flame from the burner nozzle hits the raw material sent to pallet cars by the feeder and ignites the fuel (coke) within the raw material. Making the furnace compact enables the shortening of installation time and reduction of facility costs. Furthermore, it makes it possible to significantly decrease the ignition furnace’s fuel consumption rate. Although the addition of a furnace pressure regulator would increase initial costs, it will further decrease the fuel consumption rate. Equipped with high efficiency burners developed for sinter machine ignition furnaces, the straight-directionality of the nozzles allow the flames to reach the raw material surface at a fast speed, thereby increasing thermal conductivity and igniting the raw material quickly and reliably. 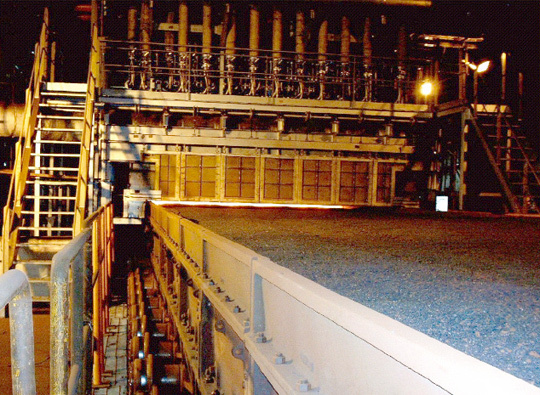 A lifting device is installed within the furnace in order to ensure that the burner flames hit the raw material surface accurately. The spacing of the burners has been reduced in order to enable even ignition of the raw material surface. The furnace temperature and the amounts of the coke oven gas and combustible air is monitored and automatically controlled by the control panel. The ignition furnace is compact. 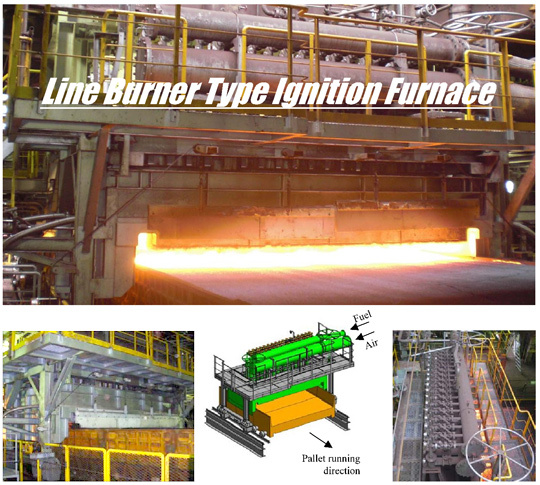 The volume has been made smaller, and the length of the furnace has been reduced by making the burner flame shorter, reducing the furnace ceiling height and shortening ignition time through high-temperature ignition. The ignition furnace fuel consumption rate has been significantly reduced as a result of the above. An ignition furnace fuel consumption rate of 10Mcal/t-sinter or less (on a COG basis) can be achieved with greater certainly through the installation of a furnace pressure regulator to maintain an appropriate furnace temperature.